Demonstration in San Francisco, October 1st 2007. Credit: Oren Sofer. All rights reserved. I write with a grievance. That grievance concerns your current definition of a certain somewhat controversial word. This word is often maligned, and rest assured I am thus sympathetic to your choice, which is both tactful and concise, doubtless the product of careful reflection. Might it not, however, be a little too tactful? As you are aware, words shape our world. Language shapes the brain. And as minds far more erudite than my own have ascertained, language can determine perception. In light of these notions, I submit my petition for redress. In the interest of full disclosure, this morning was the first time I looked the word up. I’ve done a good deal of it, spoken a good deal about it, written a good deal about it - but for the first time now I have seen its syllables rendered into sounds; I have weighed the lucid, eminently sensible definition you provide. A key word in this definition - arguably the key word - is vigorous. Vigorous is a startlingly wide-ranging word, it turns out. A word that strides across continents in tattered sandals, bags filled with flags and teargas and flyers, bullets and bread slipping from its fingers. Vigorous can look like balaklava-clad Zapatistas or a Tunisian street vendor on fire or children facing fire hoses in Birmingham, Alabama. When vigorous is having a bad day - convinced the world is out to get it, that the vast majority is fundamentally, irrevocably flawed- it is holy war, perhaps in the name of Mammon or God or military might. On a good day, when we are all more or less blunderingly well-intentioned, albeit blinded by delusion, it is principled nonviolence. Gandhi named this satyagraha, or “truth force:” literally, the insistence upon truth, in our words, our acts, and most fundamentally, our understanding. Thus this singular word vigorous begs of us a few fundamental questions: Who are we? Who are they? Fundamentally alike, or fundamentally Other? And thence: how do we create change? Yet before I leap to these questions, allow me to complete my exegesis. I confess I harbor a quarrel with this definition, and it is in regards to its limitations. Political or social change simply won’t do the trick, dear OED. The world is a shrinking splintering snow-globe wired together by spinning digits. A friend recently explained how technology distances even as it enables: a digging stick, he pointed out, puts you a few feet away from the earth. The economy: tragic mismanagement of available resources. Currently operating largely as an imaginary bubble in the parallel universe of contemporary economic theory (read: mathematics so sophisticated only a handful of academics comprehend them; or, in layman’s terms, an economy removed from worldly concerns, and divorced entirely from any of the moral order with which Adam Smith, whose primary vocation was moral philosopher, imbued it). Translates, for the vast majority of us, into numbers that either do or do not show up in our bank accounts/mailboxes/palms, whereby they either do or do not pay for the actual things that feed, clothe, and house us. The earth: tiny planet in an expanding universe, the only one thus known to harbor significant life. Very real. As real as the soil in my yard, the air I breathe as I write. As quantifiable as toxins in breastmilk and the Marshall Islands slowly swallowed by the rising Pacific. Ergo: The grossest of a host of ironies is that the ravenous appetites of an oft-imaginary economy are devastating the very real vessel upon which we (and close to another nine million species) depend. And thus, ultimately, devastating us. Or some of us. Other, we hope; vaguely, guiltily. In sum, dear OED, I am lobbying hard here for an overhaul of your definition. Activism is no longer merely political or social. It is global. It has to be. Global in the sense of corporate globalization, globalized economy, global monoculture, global consequences. And the global justice movement. Which brings us back to a few fundamental questions. One of the most powerful demonstrations I have participated in - powerful in the sense of my own felt experience - took place on a weekday at noon in San Francisco. There were around a hundred of us, garbed in crimson fabric. Very slowly, placing our attention carefully upon our feet, we walked through swaths of businesspeople and shoppers. At our head was a gorgeously-painted banner of Buddha eyes. In support of our brave friends in Burma, read our signs. May ALL beings be free from suffering. It was October 1, 2007: the 138th anniversary of Gandhi’s birth, and around a week after the historic uprisings in Burma known as the Saffron Revolution. The military junta ruling Burma had dramatically raised the prices of fuel and basic commodities, rendering them prohibitively expensive for most Burmese. May all human beings be free and happy, may all human beings be free from danger, may all human beings be free from physical and mental suffering; may all human beings be free from fear and anger. In solidarity, we were doing walking meditation down Market Street, the city’s major thoroughfare. It was a beautiful, immensely moving experience to be part of: we were focusing our own energies on cultivating peace, on the strength of inspiration, rather than trying to spread righteous indignation fueled by anger. What struck me most was the response of passers-by. Instead of moving away from us, rejecting flyers, scurrying by - a response to which I had been inured by countless other demonstrations - they came closer. They quieted, curious. They accepted our flyers. They even took photos. Lest I be misunderstood: I believe anger and righteous indignation have their place. As an oft-quoted someone once said, If you’re not angry, you’re not paying attention. But for those of us who intend to be not only vigorous but effective troublemakers, anger cannot be the dominant motivation. When anger shapes a demonstration, it does not draw people in (or when it does, seldom for the right reasons). I have seen too much preaching to the choir, too many actions in which the fun is not meant to be shared. When we talk only to ourselves, are we surprised when nobody appears to be listening? Gandhi wrote that in order to be effective, civil disobedience needs three ingredients: it must be symbolic, it must be strategic, and it must be principled. Witness the Salt March, often cited as the turning point in the struggle for Indian Independence. In the wake of the British declaring a tax on salt, thousands of satyagrahis - activists trained in nonviolence, committed to truth force - marched 200 miles to the sea to perform a highly symbolic act: to make their own salt. Photos of line after line of marchers being beaten down by police drew international attention. Thenceforth, the movement for Indian independence unfolded on a global stage. Perhaps the most powerful example of principled nonviolence I have myself observed occurred deep in the Amazon, in a sweltering place reachable only by a shuddering Cessna. In 2004 I went there to write about a community that had thoroughly captivated me: the Sarayacu. The Ecuadorean constitution maintained that while the indigenous peoples owned their land, what lay beneath belonged to the government. But when their land was auctioned off for oil exploitation, the Sarayacu pledged resistance. This community of less than 2000 mounted a months-long nonviolent struggle to prevent oil workers (and the soldiers escorting them) from entering their land. This is no small feat for a people that lives off the land. Their struggle was rooted in their indigenous principles, and every adolescent and adult participated; even mothers and grandmothers held up their traditional spears to keep the oil workers out. The Sarayacu enlisted the support of allies both domestic and global, and ultimately, they won: the Inter-American Court of Human Rights ruled in their favor against the government of Ecuador. Symbolic, strategic, principled. Still, when I was there, victory was anything but clear. I lived among them for a short time, and I was tremendously impressed with the courage, organization, and discipline of their campaign. About a week in, I interviewed one of their shamans, Atanacio. He spoke of how wealthy and blessed they were, this community that had literally nothing by the way of money. He talked about their spirituality, their connection to the land and to their traditions. When I asked him what he thought of the CEO of the corporation trying to drill on their land, he gestured wide, to the jungle around us, the river, the sky. “I think he lives far from real knowledge,” he said. Atanacio’s words changed me, as an activist. It had nothing to do with evil. Nor was it as simple as greed. It did, however, concern a certain distance from the truth. In short, the issue was ignorance. The Buddha said that at the root of all delusion - all our clamorous grasping and fractious antipathies - lies ignorance. And ignorance he defined as essentially a belief in the separate self. 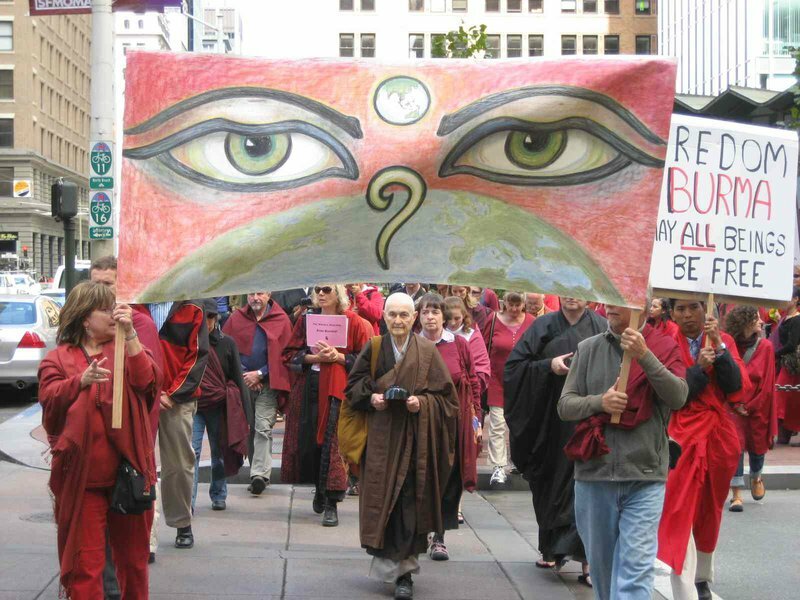 Real knowledge, truth force, demonstrators chanting the Metta sutra: these are the ways we make change when no war is holy. These are the ways we trouble-make when there is no Other. When there is only Us, and more, albeit different, Us. The headaches are global. They are blinding migraines from which few inhabitants of this planet will escape entirely unscathed (even the one per cent have children and grandchildren who breathe, eat, and fall sick). And they arise from precisely what the Buddha called ignorance: a belief in the separate self. A separate self who must fight for limited resources. A separate self who must compete against other separate selves. A separate self who must wield all the might he can muster to fend off the ire of other separate selves. This belief is killing our companions on this planet. It is killing large parts of the planet itself. And ultimately, unless vigorous trouble is made, and made effectively, it will kill us. Darkness cannot drive out darkness; only light can do that, said Martin Luther King. Hatred cannot drive out hate; only love can do that. How we view who we are determines how we try to change the world. And it is too desperately urgent right now to make change any other way than effectively. Wisely. Creatively. Lovingly. And optimistically, if optimism is what it takes to see us as fundamentally good, blunderingly well-intentioned, albeit clouded by delusion. For a consciousness rooted in separation cannot drive out a consciousness rooted in separation. Only wise understanding, as the Buddha put it, can do that. To me, wise understanding means seeing all of it. Yes, there’s enough bad news to drive you into fits of rage and despair. But there’s also a global justice movement, and it is indeed vigorous. It looks like Occupy and the Arab Spring and Sarayacu and the Saffron Revolution and Taksim Square. It looks like Sufi dancers wearing gas masks and crimson-robed monks filling the streets of Rangoon. It looks like Yemenis weeping with joy at the advent of democracy and demonstrators holding Zuccotti Park signs in Rome, Madrid, and London. In essence: it looks like Us. Otherwise defined as: real people making real change. I am grateful for your serious consideration of this consequential matter. This article is co-published with 580 Split at Mills College, California.